The Star exists to bring hope and peace to the hero of the story. Dean, burdened with his decision to allow or not allow Michael into his body turned to Lisa. 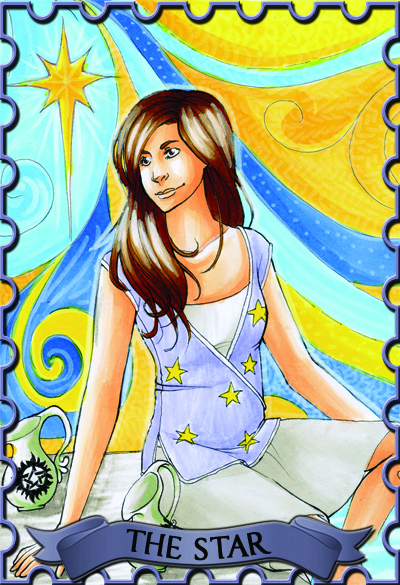 The Star is a card that everyone loves, and is often the most beautiful card in the deck. It is there to offer comfort to the hero and bring a sign of relief. Although, this relief may not be immediate. When Dean again turns to Lisa at the end of Season 5, she becomes the symbol for hope and change that he needs at the moment. The trick is that the card may not be that future. It only predicts the future, the hero must find his own way to it. Lisa seemed the obvious choice for this card. It is difficult to dislike someone who brings peace and a family atmosphere like Lisa does to Dean. Symbols: I used a lighter style than I normally do in this picture, the thin outlines make it look less dynamic, but more peaceful (I hope). There are six stars on her shirt and one in the sky for a total of seven as the card requires. Lisa dips her feet into a pool of water and gazes into the sky introspectively. There are also two pitchers of water sitting next to her, they both have the protection pentagram stamped on them, the same one that Sam and Dean have as tattoos. I added this as an extra detail to represent the safety of the card.